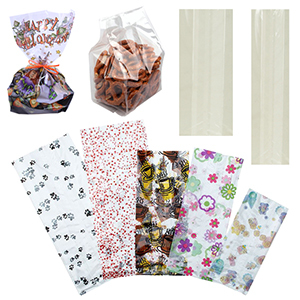 Use these Cello bag for candies, sweets and more! Ideal for candy stores, bakeries, and even restaurants. These Cello bags are gusseted, so they are able to stand for easier filling. We have labelsandmetallic twist ties for that professional looking finish available too. These Cello bags are made from 100% recycled material, and are FDA approved for food contact. Cello Bags are 1.2 Mil thick and come in a variety of sizes.